Garbage collectors will not pick up green waste. 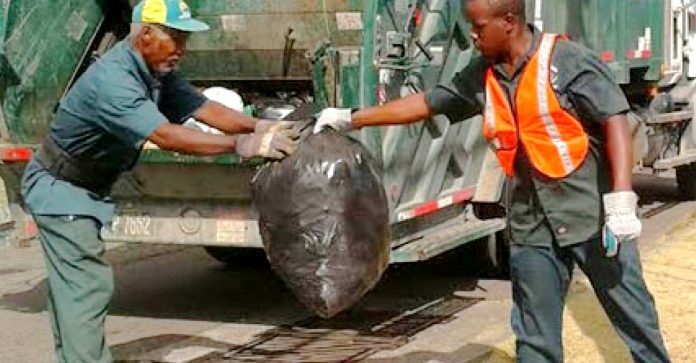 BASSETERRE, St. Kitts –- Green waste cannot be picked up and comingled with combustible materials such as aerosol because fires can result, so it will not be picked up by Solid Waste Management Corporation’s (SWMC’s) trucks, according to General Manager Keithley Phillip. Green waste is biodegradable waste that can be composed of garden or park waste. It includes things like grass clippings, shrub and yard clippings, branches, woodchips, bark, wood, palm trees, branches and weeds. Phillip said SWMC is enforcing this policy to keep the country safe. Phillip said green waste should be taken directly to the landfill. There, the waste will be weighed and people will be billed accordingly.